The Deep South state of Louisiana is divided into two regions: the fertile uplands area and the swampy coastal regions in the south. 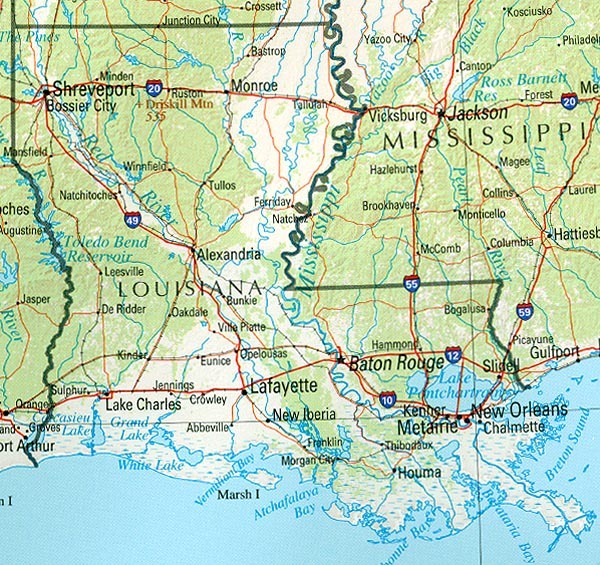 The Mississippi River forms the eastern border with Mississippi before cutting through the southern half of the state and emptying into the Gulf of Mexico at the Mississippi Delta region. The Sabine River and the Toledo Bend Reservoir forms part of the western border with Texas. The northern parishes of Louisiana, with its woodland and prairies, contrast sharply with the wetter delta regions in the south. Though the Spanish were the first to explore the region, the French set up permanent settlements toward the end of the 17th century, maintaining dominance in the region until Napoleon Bonaparte sold the lands to the U.S. in 1803. Before that date, the region had changed hands several times, first to the British, then to Spain and lastly back to France. 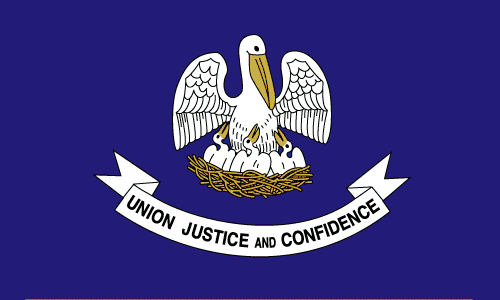 On April 30th, 1812, Louisiana became the 22nd state to be admitted to the Union. Development of cotton plantations began intense development throughout the 1800's. Louisiana seceded from the Union in 1861, and a year later, New Orleans was captured by Union troops. The largest ancestries in Louisiana are African-American and Franco-African, at approximately 32.5% (2005 estimates). These groups have contributed to a great portion of the culture and history of Louisiana, and in particular New Orleans, a city which saw the rise of Jazz. The vast majority of African-American culture in Louisiana is in fact distinctly Franco-African. Creoles of West-African heritage dominate much of the southern regions of Louisiana, while the White population of Louisiana is the great majority in much of the northern parishes of the state. Louisiana is the largest producer of crayfish in the world. Unsurprisingly, seafood dominates the state's agricultural outputs. Tourism is an important economic earner, while petroleum, food processing and chemical products are a critical part of Louisiana's industry. Baton Rouge is the capital of the state whereas New Orleans is the largest city, cultural, economic and entertainment hub, as well as a major sea port. Crime in Louisiana is a significant problem. The state leads the nation in homicides per capita, the per capita number of state and federal prisoners in jail, as well as relatively high levels of aggravated assaults and violent crimes. Health is also a major concern in Louisiana. The state came out dead last in the Health Index published by Morgan Quitno Press, with a high rate of child death, the highest rates of STD's like syphilis, chlamydia and gonorrhea and low health coverage for residents. These issues were only exacerbated by the onslaught of Hurricane Katrina in 2005, where damaged levees flooded much of New Orleans, displaced approximately two million people and killed more than a thousand residents of Louisiana. The effects of Katrina (and later Rita) are still being assessed, though hundreds of millions of dollars will be needed to rebuild New Orleans, one of the most historic and cultural cities in America. Louisiana tends to vote Democratic on local state levels, and recently, Republican on the national level. The state gave its 9 electoral votes to George W. Bush in the last two elections. 12th December 2007	 Put some half decent statistics on louisiana!!! !